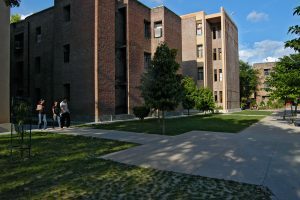 IMT Ghaziabad has a lush green campus spread over 14 acres. Its state-of-the-art infrastructure is ranked among the best in the country. The institute has recently renovated Management Development Resource Centre (MDRC) Hostel block, placement office and conference/committee rooms, equipping them with the latest technology and infrastructure support. The academic building showcases modern architecture, offers cutting-edge teaching facilities, and gives the precinct a dynamic and vibrant atmosphere in its celebration of open spaces and natural light. The academic block houses 15 smart futuristic classrooms, each equipped with the finest audio-visual and interactive technology. The MDRC block catering to the short-term executive programmes has a recently renovated guesthouse for participants. We have increased the number of rooms from 36 to 54 (double occupancy) and also added multiple meeting and conference rooms equipped with ultra-modern equipment and world-class furniture & fixtures. We have also improved the interiors of the rooms to provide more comfort and luxury to the participants of the MDP programmes. The new state-of-the-art placement office is very spacious and provides all facilities to the corporates to make them comfortable during the hectic placement season. The institute also has an incubation room for supporting the entrepreneurial plans of its students and alumni. 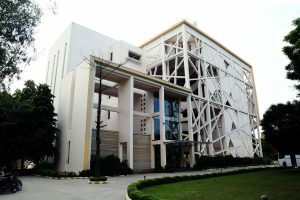 The infrastructure also includes a state-of-the-art, air-conditioned computer laboratory with smart workstations. We have also renovated office spaces like PGP Office, IT Office and IRC to give more vibrant atmosphere to work. We have also added new office spaces for the additional work force. IMT has fully Wi-Fi enabled campus with around 1000 nodes connected with a backbone of 10 Gbps fibre connectivity with multi-layer, high-end Cisco campus-wide network. IMT has 420 Mbps (1:1) Metro Ethernet connectivity which can be upgraded to 1 Gbps on demand. We have 13 enterprise level servers to support domain, applications, security and storage service. The server room is designed as per international standards. Each faculty member is equipped with latest laptops and dedicated laser printers. We have provided 24×7 connectivity to the students. The faculty, students and alumni have been provided with an official email account accessible from anywhere in the world. All classrooms are equipped with Wi-Fi enabled projectors having the capacity to connect up to 16 computers at a time, compatible with Android as well as iOS platforms. A sound reinforcement system for addressing has been provided, using Green Extron class D power amplifier & hi end speakers having wide frequency spectrum with high SPL. IMT has academics alliances with leading IT companies namely, SAP, SAS, Cisco and Microsoft, which enables us to provide world-class technology education to all our students. Finance lab has a full-fledged 12 Bloomberg, which is unique in India. This enables integration of the latest technology in the curriculum, making it industry ready. Using Bloomberg simulations, students learn how a real trading floor in commercial and investment banks function by the time they pass out, students become experts in the Bloomberg software, making them ideal candidates for blue chip finance companies. The BMC certification by Bloomberg also provides a globally recognized tag and a tremendous addition to the students CV. Real Time Contextual Laboratory (RTCML) adds a major differentiator to IMT Ghaziabad to make Digital marketing and Consumer Insights domain unique not just in India but globally. RTCML hosts a number of proprietary tools (Salesforce marketing cloud-social studio, Hoot suite) and open source Digital Marketing, CRM and Analytics tools (Tableau, R, SAS, NVivo) for a wide array of functions like audience sentiment measurement, marketing automation, other customer facing functions and data processing and visualisation. The RTCML framework developed by IMT captures online and offline data to create onmi-presence experience. RTCML is engaging with tier 1 DM players in joint solutions development. RTCML is also a platform for the institute’s IP creation in areas like beacon based proximity marketing, predictability solutions in media and banking domains. The Smart Analytic Decisions Lab serves the need of the students who go for specialization in the Analytics track. Renovation of old computer labs has been completed, and now all the labs will have a total of 244 HP AIO desktops using the latest technology to serve the requirement of IT/Systems. A fully Air Conditioned new block of hostel is under construction with state of the art recreational facilities. This hostel block will house 500 students, the phase I of the said hostel has already been operational since June 2018. 300 students are already staying in this hostel. The second phase is likely to be completed by Jan 2020. An elegant auditorium building adds to the beauty of the campus and can accommodate 570 seated guests. It offers a spectacular venue for large conferences, seminars, film screenings, presentations, theatre and cultural performances of all kinds. Its audio-visual facilities promise guests a memorable experience every time they grace an occasion on campus. The dining building houses an air-cooled dining hall for the students on the ground floor and air-conditioned dining hall for faculty, staff and guests on the mezzanine floor. This building can cater up to 600 persons at one time. Other facilities at our institute include separate hostels for male and female students, extensive library facilities, seminar halls, reading halls, outdoor and indoor sports grounds and medical room for staff, students and visitors. The college mess offers both vegetarian and non-vegetarian food. Never starved for things to do, those in a sporting mood or the serious outdoor types can avail of the various recreational facilities. Outdoor sports include the game all of India is obsessed by – Cricket. 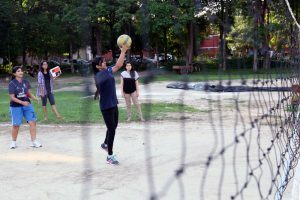 Other outdoor games you can play on campus are Football, Volleyball, Badminton and Basketball. Those who prefer getting their recreation in controlled indoor environs can indulge in games like table tennis, carom and chess. The campus also has a well equipped gymnasium complete with weights for students. Free to move as they please, students are often seen simply chilling at the amphitheatre. It is a favourite spot with many students who come here to unwind or for some peace and quiet while they concentrate on their studies. Various management computer games are a huge draw. Student teams organize themselves and compete with each other, trying their best to do that extra point better, go one level higher and set new records. Throughout the year, while studies and academics are in focus, the mind needs to unwind. For that, student committees like the ‘Cultural Committee’ and ‘Sports Committee’ organize myriad events through the year.